I had never tried a “real” VR system until today, when I got to demo the Oculus Rift. Although I have a lot of experience with 3D photos and videos, Google Cardboard, and 360-degree cameras, I was still very impressed. It was the first time I truly felt as though I had been transported to another environment. The demo consisted of two parts: the first part consisted of a series of vignettes meant to get you used to experiencing VR. The second part was a demo of a rock climbing game, the Climb. When I wore the headset, I saw a modern living room. Although the graphics were not photorealistic, for the briefest moment, my mind was fooled into thinking that I truly was there, in that living room. Everything looked like it had the correct proportions and perspective that you would expect if you had been in such a living room, looking around. Then I “remembered” that it was just a demo. But even after the initial shock wore off, I still felt like I was there. Rather than feeling like I was using a device to see a room, it felt transparent and the Rift melted away, as though I was physically there, looking around at the room (not at the Rift) with my own eyes. One analogy I would make is like the difference between a daydream and a dream. When you daydream, you know you’re daydreaming and you’re more aware of your body where it physically is. If I asked you where you are, you would respond, “Right here!” But when you’re dreaming, you’re usually not aware of your body in the bed. Instead, you feel like you are in the location that you’re dreaming of. If someone could ask you where you are, you would respond with whatever location you were dreaming about. I’m not saying the Rift felt as real as being in a dream, but it did fool my mind into “feeling” that I was in that room. It was very impressive, considering that my logical brain was constantly reminding me it was just a demo, and there was a sales rep beside me, talking to me and guiding me through the demo. Yet it still felt like I was in that digital living room. I think that, to my mind, the perspective of the room was sufficiently convincing that it felt more real than my actual physical location. To be fair, I am somewhat visually oriented, and I don’t know if a person who is auditorily or tactilely oriented would have been similarly immersed. Another observation: if I recall a time when I’m watching TV or Google Cardboard, I recall the feeling of looking at the TV or watching something through Cardboard. If I try to recall the experience of being a Rift, the memory seems very similar to the memory of a dream (but again, I’m not saying that it’s as real as a dream). As I said, I believe the feeling of being there had nothing to do with the realism of the graphics. The first demo was a digital forest, which reminded me of the Google Cardboard demo “Artic Journey.” The graphics were very simple. About as simple as the graphics of the first Playstation. Yet, to me, it still felt like I was in that digital forest. The next demo scene looked like the surface of the moon, with a humanoid alien in front of me. 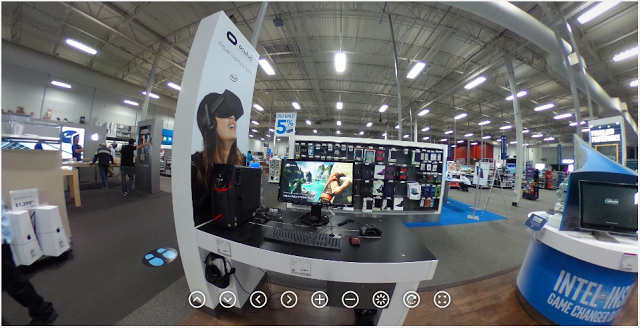 Although the surface of the virtual world was rough, with bumps and dips, contrasting with the smooth floor at Best Buy, the illusion of immersiveness was maintained. Another demo showed a small city in front of me. Again, the graphics were as simple as those of the Playstation. Moreover, I sort of recall that I was supposed to be in the clouds looking at the city. Obviously, the floor felt nothing like the clouds in the scene, but again, it still felt like I was there. In the next vignette, I was transported to the top of a tall skyscraper, on a narrow ledge. This was an interesting demo because you could peer over the ledge, and it genuinely felt a little scary to step over the edge, even though again my left brain was telling me it was just a demo. Finally, there was a scene of a museum hallway where a Tyrannosaurus Rex enters and begins charging at you. The T-rex was impressively modeled, but the strongest impression I got was how the hallway felt. Again, although it fell short of a photorealistic hallway, it truly felt like I was in that hallway. What was most interesting to me about this game is that when my character fell off the cliff, my body had a physical reaction similar to how you feel when you have a dream about falling, and for a moment it feels like truly falling, even though you’re just in bed. It felt more or less like that. Not just the first time I fell, but even on the second and third time that my character fell. At the end of the demo, I took off the headset and the sales rep said, “Welcome back!” To an observer unfamiliar with virtual reality, the greeting may have sounded strange or even cheesy. But it was absolutely appropriate because I really did feel that I was coming back from a trip. So, how similar is the Oculus Rift to the Google Cardboard and Gear VR? To me, they’re similar in concept, but in actual feeling, they are completely different. With Google Cardboard, it feels more like looking at a 3D TV, in my opinion. I don’t feel immersed, and it feels nothing at all like the Oculus Rift. Please note, I ‘m not trashing the Cardboard. I still think it’s awesome, and in my opinion, VR owes a lot of its growth to the humble Cardboard. But if you think you know have an idea of what VR is like simply because you’ve used Cardboard, I think you will be pleasantly surprised. I’m not an expert on the Gear VR, but I did get to try it. In my opinion, the Gear VR is significantly better than the Cardboard. I don’t know exactly why, but it feels more immersive. It might be because of the responsiveness of the head-tracking. I don’t know. All I know is that to me, it feels more immersive than the Cardboard. Having said that, it feels only slightly like the Oculus Rift. Nonetheless, if I had a compatible Samsung phone, I would undoubtedly get a Gear VR. Besides the access to apps, I feel it is significantly better than Cardboard. (But please note, my Cardboard viewers are only low end ones). UPDATE: I’ve since gotten a Gear VR and determined why it feels different from Cardboard – reviewed here. WHAT ABOUT HTC VIVE AND PLAYSTATION VR? During the demos, I was able to move around a very small space (essentially, one step in any direction). This gave me the impression that the room-scale VR of the HTC Vive would be much better, and the difference in cost would be totally worth it, in my opinion. However, I don’t think a system’s technical superiority would be sufficient for it to dominate its category. I would prefer to play a game that is fun on a system that is less immersive, than to play a game that is less fun on a system that is more immersive. Which system would have the best games? It’s far too early to say. I speculate that Playstation VR will have a much larger user base, which would mean that all other things being equal, developers would prefer to develop for the PSVR. If so, it may mean that the PSVR may have a larger library of games. On the other hand, I have never tried the PSVR, so I would withhold judgment until I actually try it and see their games. In any case, trying out the Oculus demo has made a VR believer out of me. I’m very much looking forward to getting a VR system (or two or three). What’s the difference between 360 and VR? Here’s a true VR camera!